In the world of Wes Anderson films, every detail—from costumes to film props to cinematography—remains highly stylized with a clear love of nostalgia. So when the Kunsthistorisches Museum in Vienna invited him and his partner, costume designer, author, and illustrator, Juman Malouf, to curate a show opening on November 6th, it should come as no surprise how meticulous they both were in their approach. Taking two years, the couple pored over four million objects from the museum’s vast archives as well as items currently on display. “Spitzmaus Mummy in a Coffin and Other Treasures” will showcase the sum of their favorite pieces within the stately halls of the 19th Century KHM building. In some ways, the actual museum space provides the ideal setting for this exhibit, just like the old Eastern European feel of the palatial exterior and interior of “The Grand Budapest Hotel.” And never missing a beat, Anderson and Malouf nod to the museum’s location with a German word in their show’s title: a spitzmaus is literally a mouse with a pointy nose. And one of the key pieces of art chosen for the show includes a spitzmaus coffin. Anderson and Malouf carefully selected more than 400 objects from the museum’s fourteen collections with 350 coming from the museum’s storage. Many will be displayed for the first time. 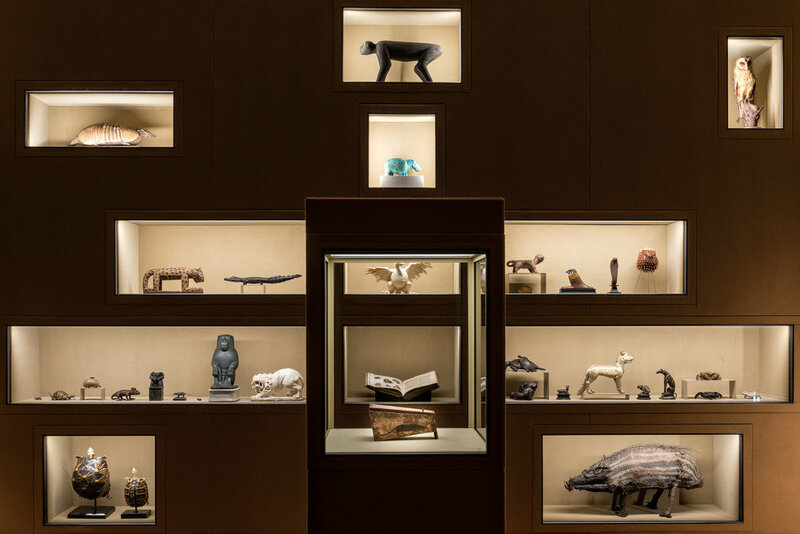 Egyptian, Greek and Roman antiquities, Old Master paintings, animal figurines, musical instruments, costumes and props from the Theatermuseum, historic coins and pieces from the Imperial Armory reflect the two guest curator’s specific aesthetics. This is not the first time the museum welcomed guest-artist curators. Previously, American artist Ed Ruscha and British ceramicist and writer Edmund de Waal selected items for their own shows at the KHM. Curator, Jasper Sharp, wondered: Who would be next for the third round? As a bonus—and a personal touch—Malouf provided her own pencil illustrations of particular items on display, and they are printed in the show’s catalogue. And just like the excited anticipation that comes on the eve of a Wes Anderson film opening, this new museum show promises something similar: a distinctive, cinematic eye for detail and placement with an unconventional method to bringing everything together—all while maintaining his signature, vintage direction. Anderson’s films often assemble a diverse cast of characters brought together under one plotline. The narrative of this museum show embraces a bit of humor, hints of drama, some romance, and compelling storytelling all the way to the end. Could it be that this exhibition is just like one of his films? To find out, take the next flight to Vienna. -S.C.
Spitzmaus Mummy in a Coffin and Other Treasures opens at the KHM Vienna on November 6, 2018 and runs until April 29, 2019.